Bambo Nature Disposable Diapers are an eco friendly alternative for when cloth is not an option. At Green Lil' Bums we clearly love our fluffy bums, but we understand that there are times when disposable diapers are the better option. Whether it is your preferred way to diaper, the holiday season, a weekend camping trip or a family vacation there are instances where an eco friendly disposable is nice to have on hand. 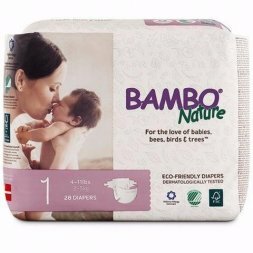 We have a stock of Bambo Nature in sizes ranging from premie to over 60 pounds, including trainers and wipes. But, why order from us? We have an autoship program that gets delivered to you every 4 weeks. Our terms & conditions are very simple. We want you to feel at ease in choosing Green Lil' Bums. There is No sign up fee. No cancellation fee. You may cancel at any time. If you have any unopened bags of Bambo Nature we will happily exchange for the next size or refund in full. As always, we offer free local delivery and will exchange or return any unopened packages no questions (great for when baby sizes up or potty trains). Not sure if Bambo would work for you? Contact us for a free sample. What makes Bambo Nature so great? *Wood used for pulp is derived from sustainable forestry. *No chemicals, compounds or substances that are harmful to the environment are used or added during the production process (SVHC, Phthalates, Organotins [MBT, DBT, TBT], heavy metals, Chlorine (CI), Formaldehyde (HCHO) Colophonium, AZO pigments, PVC), this includes no optical brighteners, no skincare lotions, no perfumes or essential oils and no odor eliminators. *Bambo Nature's manufacturer, Abena, requires a reduction on energy consumption and they are produced on the newest and most efficient diaper machine. *Abena adheres to requirements on resource consumption where they recycle 95% of all waste from the production of diapers. For instance, even powder and dust from the plant is filtered, collected and sold for further use. Price is per package - they are delivered every 4 weeks, every other week or every week depending on your needs! Washing cloth diapers at home is a great way to be environmentally friendly and save some money. However, when using a residential washing machine (particularly HE machines) you can get a build-up on your diapers of soap, urine or minerals found in water. Build-up can lead to diapers that smell after washing and/or a diaper rash. Even having a perfect wash routine can result in build-up. Having your diapers deep cleaned can help keep them nice and fresh. We use commercial washing machines and a professional washing technique to get the diapers back to base clean. No need to spend your weekend soaking your diapers in your bathtub! Give us the dirty work. How many diapers do you need stripped? More than 60 Contact Us! We are happy to pick up your diapers from you and deliver them nice and clean a week later. If you would like to drop them off and pick them up yourself our turn around time is 3 business days. After purchasing new, natural fiber diapers (or inserts) they need to be washed up to 6 times to become fully absorbent. Washing removes the naturally occurring oils found in the fibers. Green Lil' Bums can prep diapers more efficiently in our commercial washing machines - we use less water and energy than residential washing machines and we only need to wash the diapers 3 times for them to become fully prepped. ONCE DIAPERS ARE PREPPED THEY ARE NOT RETURNABLE.